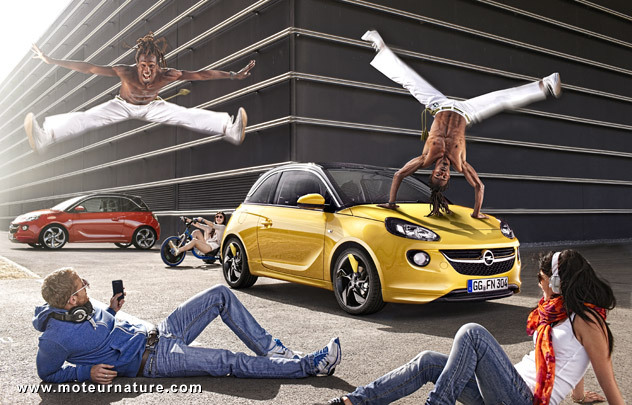 The Opel Adam has style but how about an electric drive? This is one of Europe’s hottest segments. Small cars with an attitude. Like the Mini, the Fiat 500, or the Citroen DS3 (not available in the U.S.). They are all small, easy to park and drive in the city, cheap to run, yet without any compromise on style, inside or outside. The driver must feel good inside one of those cars, and he does. Because small size should not be an excuse for the lack of creature comforts or expensive equipments. Opel, the European arm of General Motors, has chosen to enter this important segment of the market. Judging only from its design, this Opel Adam looks to be a winner. The two-tone interior is very attractive but the little Adam doesn’t shine as much under the hood. Its platform comes from the Corsa, only a bit shortened, and at launch, only engines available will be a 1.2 or 1.4 liter 4-cylinder. Neither is turbocharged nor have direct fuel injection. A new strong and modern turbocharged 3-cylinder shall be added late next year, but we remember the rumor of an electric version. The Adam was known earlier as the Junior, and a rumor was that Opel was engineering both a gas and an electric version. There’s no word about that second model yet, but we hope to learn about it at the Paris motor show, on the official unveiling. An electric Adam could share its motor with the upcoming Chevrolet Spark EV, and there’s definitely a market for a small stylish EV in Europe.